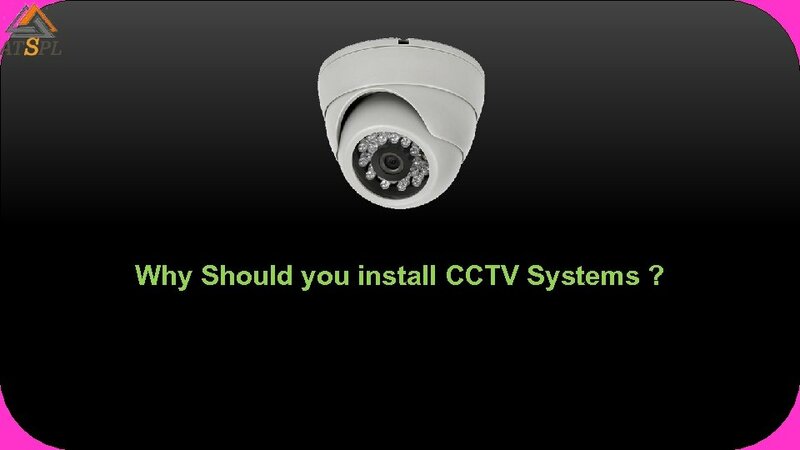 Why Should you install CCTV Systems ? 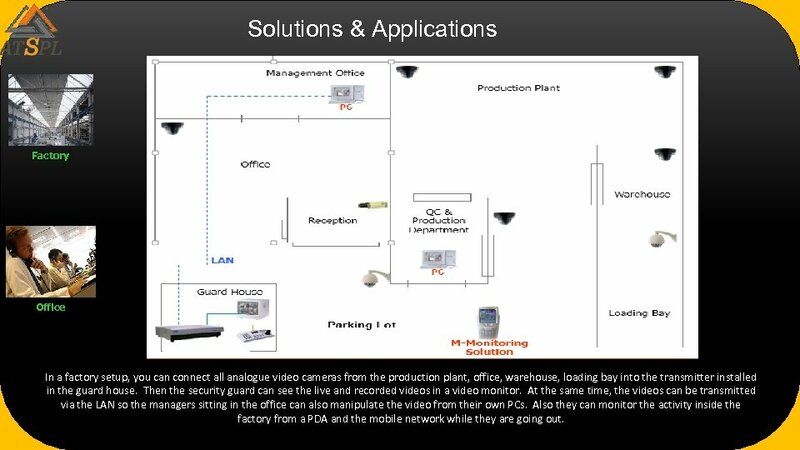 Solutions & Applications Factory Office In a factory setup, you can connect all analogue video cameras from the production plant, office, warehouse, loading bay into the transmitter installed in the guard house. 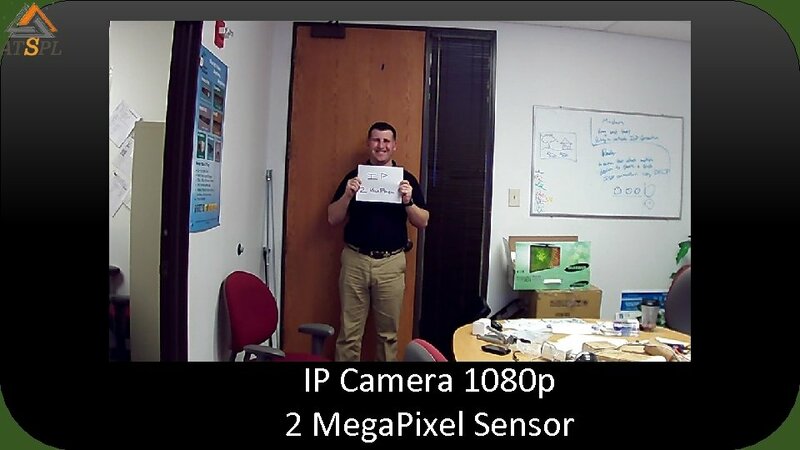 Then the security guard can see the live and recorded videos in a video monitor. 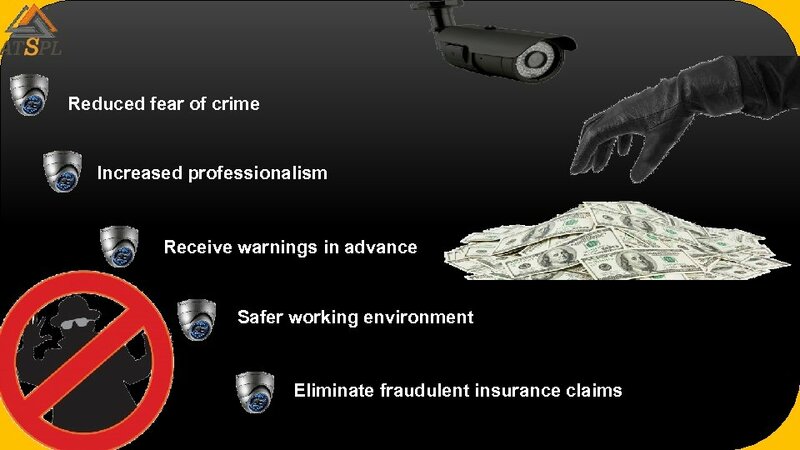 At the same time, the videos can be transmitted via the LAN so the managers sitting in the office can also manipulate the video from their own PCs. 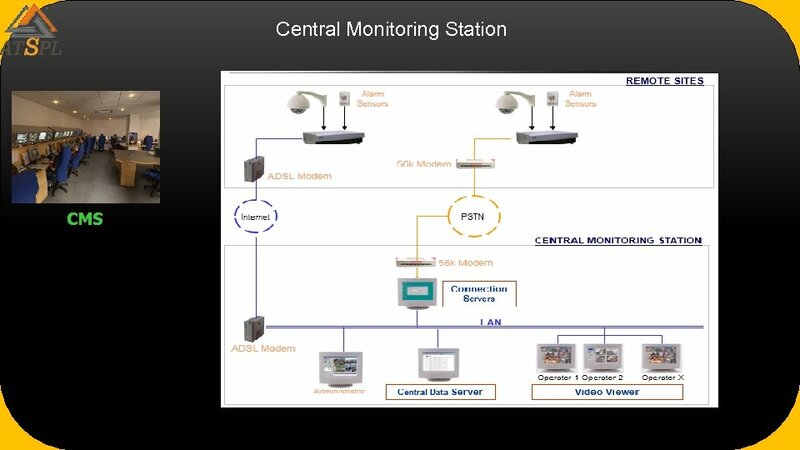 Also they can monitor the activity inside the factory from a PDA and the mobile network while they are going out. 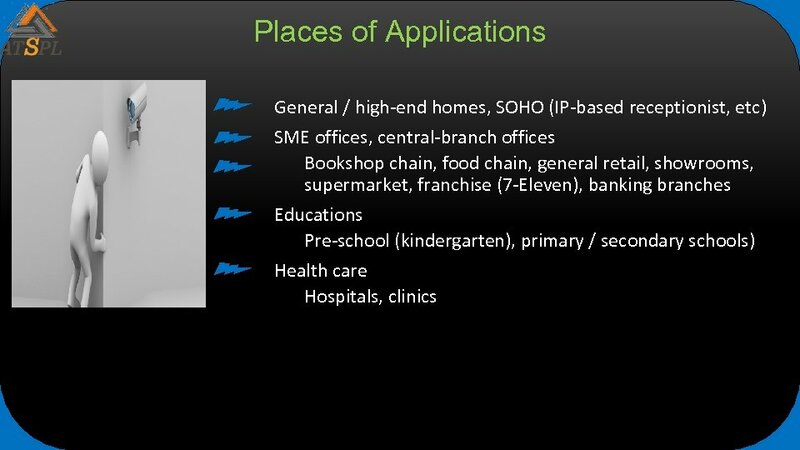 Solutions & Applications Convenience Store Petrol Station ATM For retail chains like convenience stores and petrol stations, the managers in the company’s headquarters can monitor the current activities in every branches via the Internet. 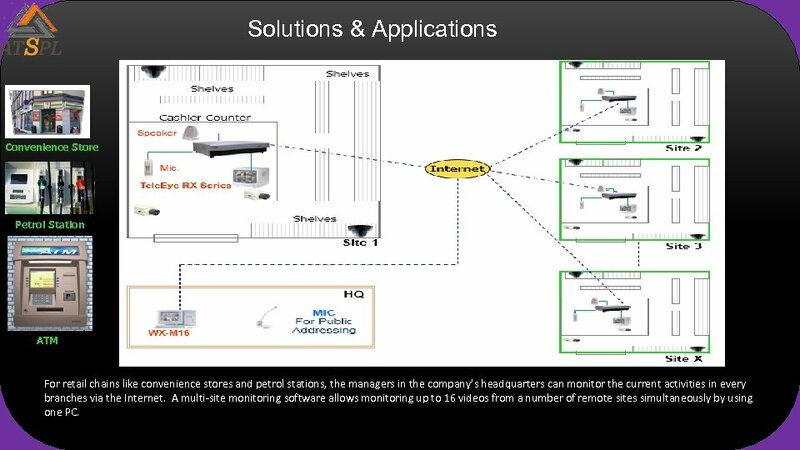 A multi-site monitoring software allows monitoring up to 16 videos from a number of remote sites simultaneously by using one PC. 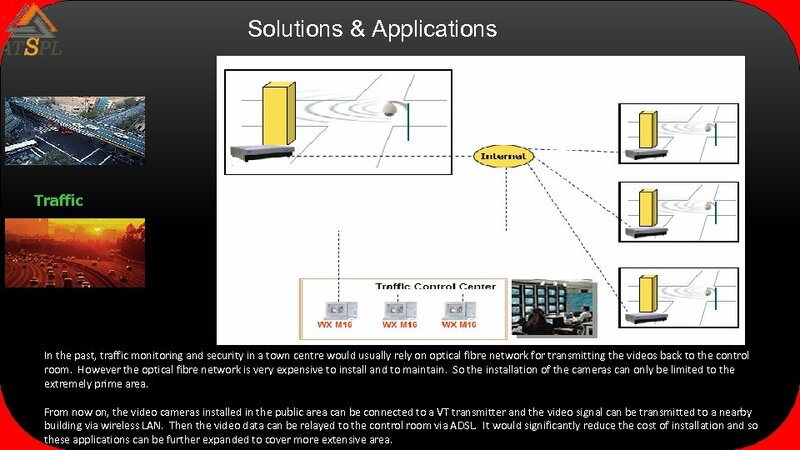 Solutions & Applications Traffic In the past, traffic monitoring and security in a town centre would usually rely on optical fibre network for transmitting the videos back to the control room. However the optical fibre network is very expensive to install and to maintain. 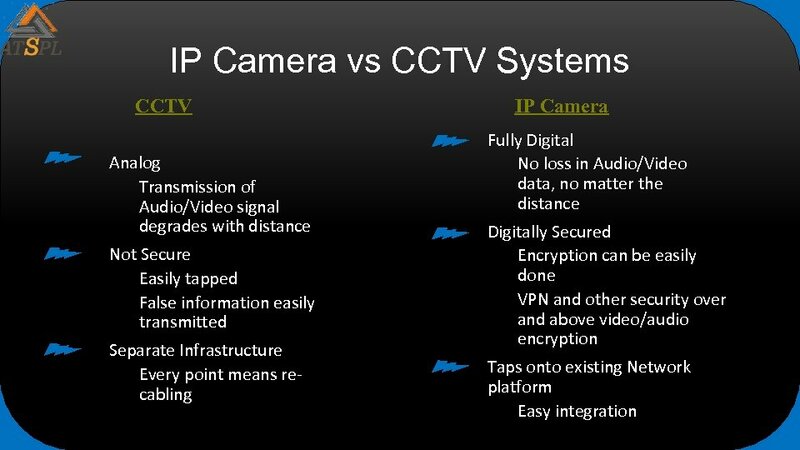 So the installation of the cameras can only be limited to the extremely prime area. 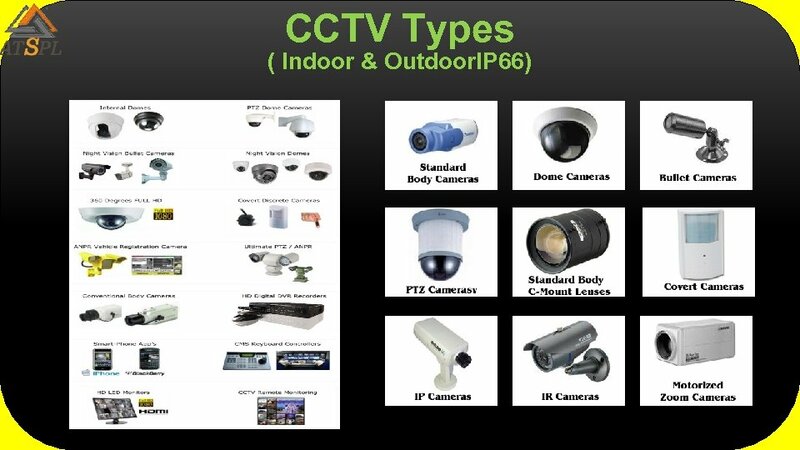 From now on, the video cameras installed in the public area can be connected to a VT transmitter and the video signal can be transmitted to a nearby building via wireless LAN. 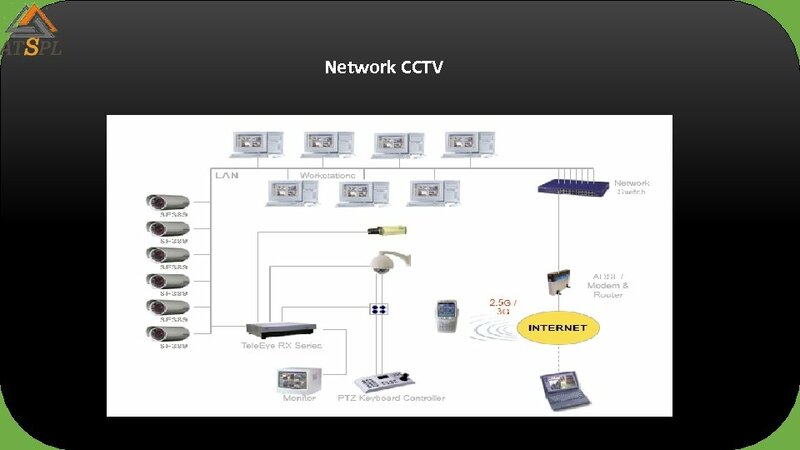 Then the video data can be relayed to the control room via ADSL. 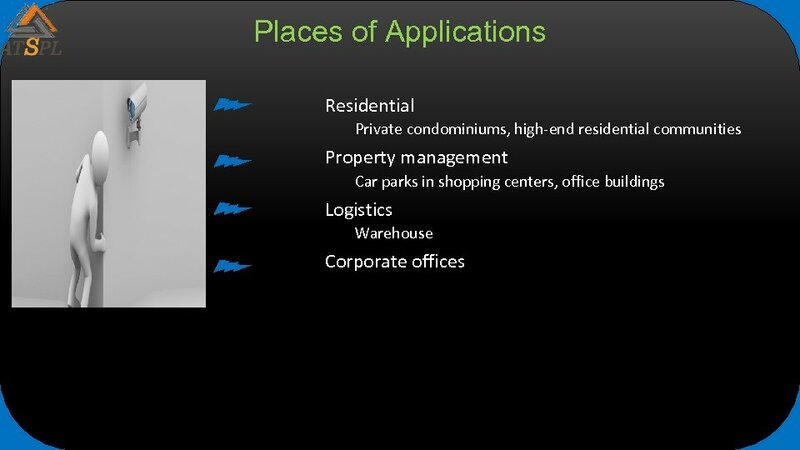 It would significantly reduce the cost of installation and so these applications can be further expanded to cover more extensive area. 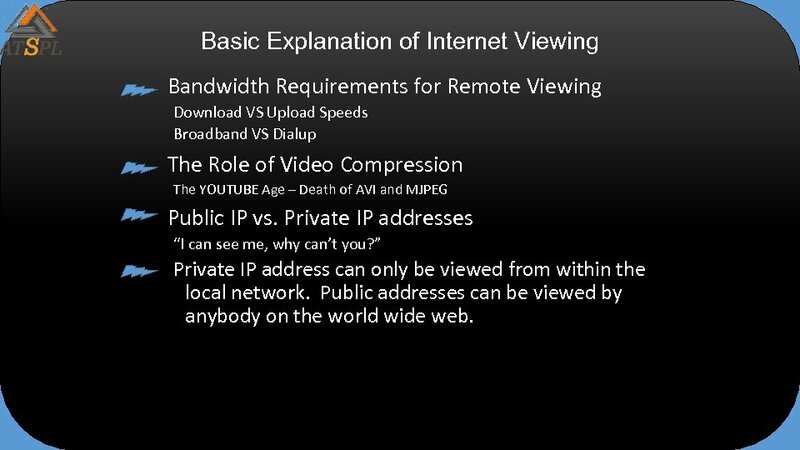 Basic Explanation of Internet Viewing Bandwidth Requirements for Remote Viewing Download VS Upload Speeds Broadband VS Dialup The Role of Video Compression The YOUTUBE Age – Death of AVI and MJPEG Public IP vs. 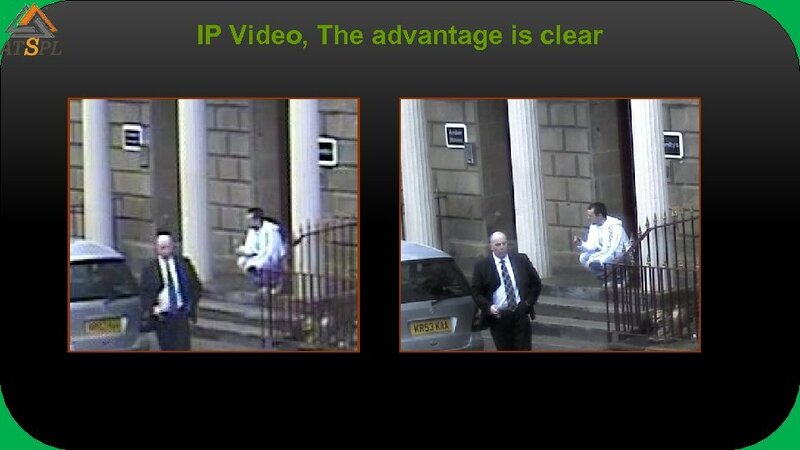 Private IP addresses “I can see me, why can’t you? 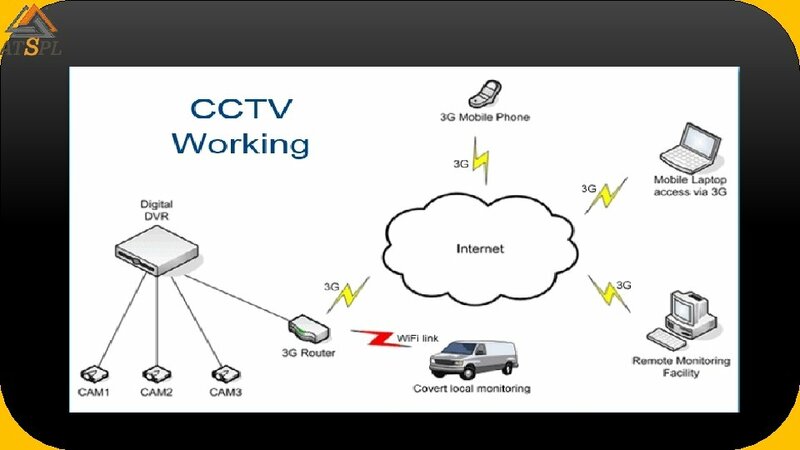 ” Private IP address can only be viewed from within the local network. 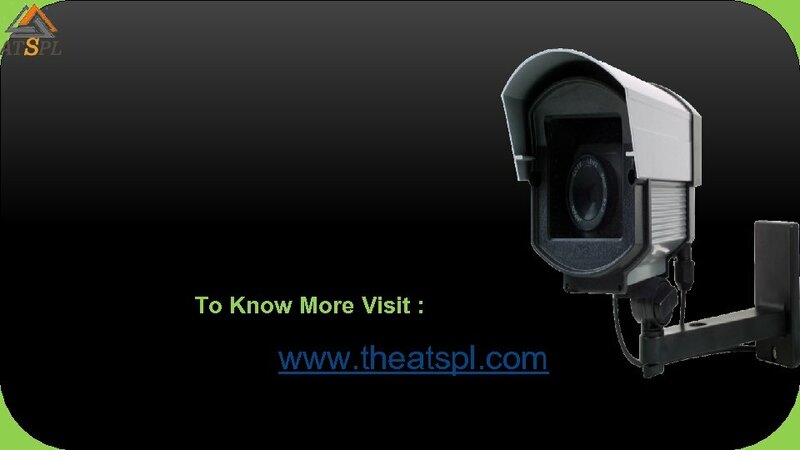 Public addresses can be viewed by anybody on the world wide web. 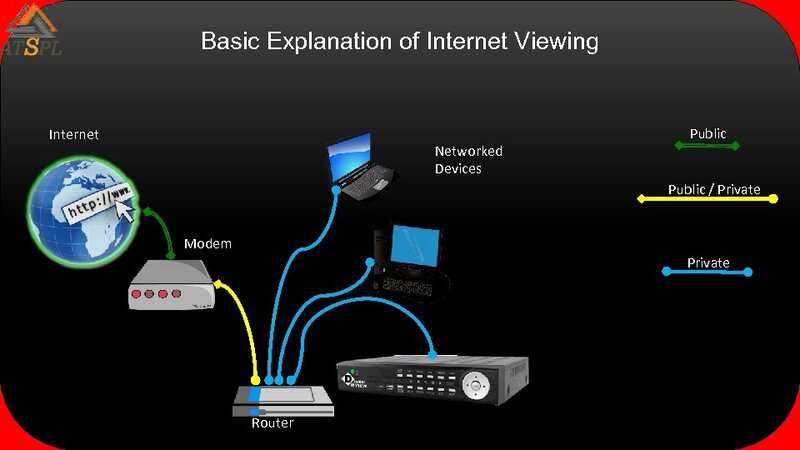 Basic Explanation of Internet Viewing For the DVR/Video System to work correctly you need to make sure customer has sufficient bandwidth. At the DVR site you need to be concerned about “upload” speed. Minimum of 500 kbps is suggested. 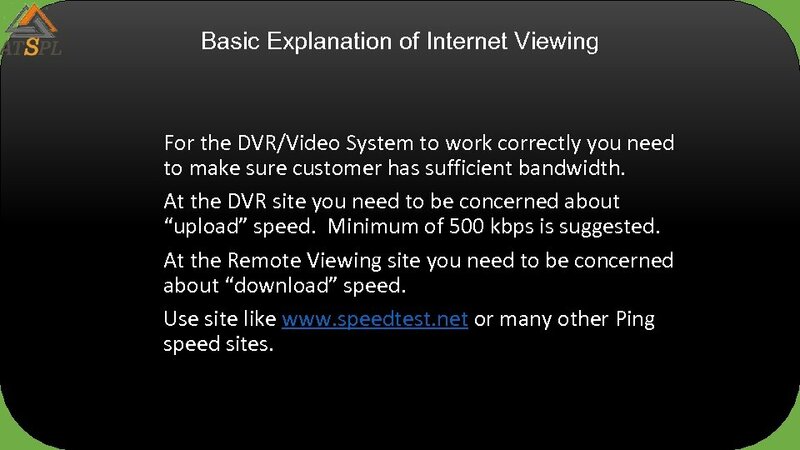 At the Remote Viewing site you need to be concerned about “download” speed. Use site like www. speedtest. net or many other Ping speed sites. 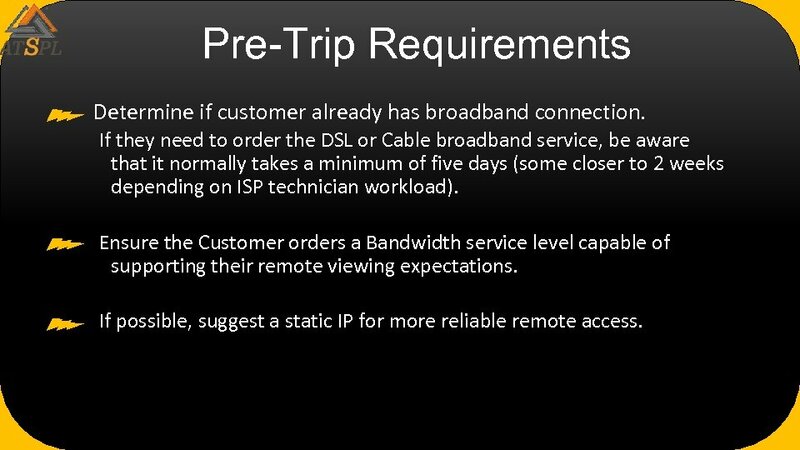 Pre-Trip Requirements Determine if customer already has broadband connection. If they need to order the DSL or Cable broadband service, be aware that it normally takes a minimum of five days (some closer to 2 weeks depending on ISP technician workload). 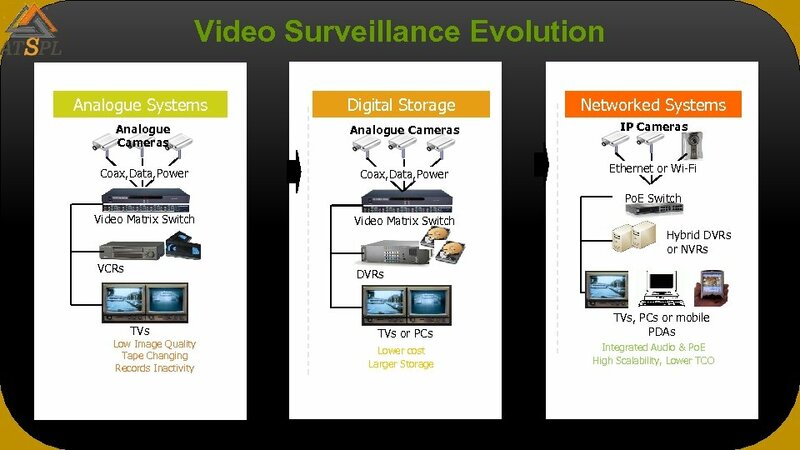 Ensure the Customer orders a Bandwidth service level capable of supporting their remote viewing expectations. If possible, suggest a static IP for more reliable remote access. 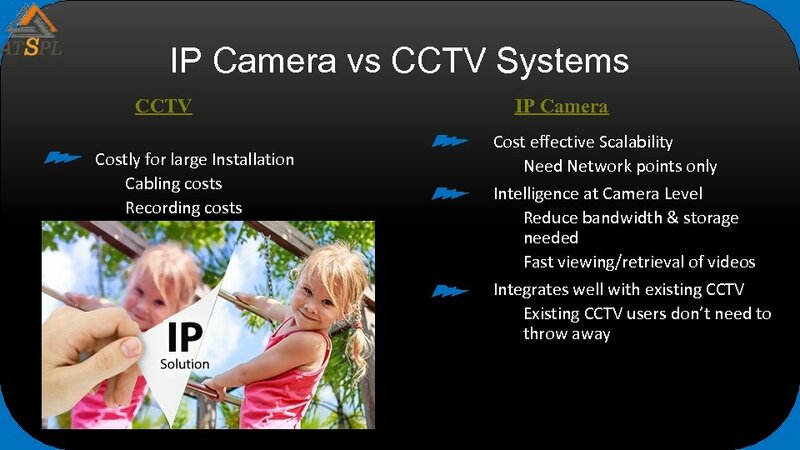 IP vs analog HD-SDI IP Camera Systems • Most popular IP Video Management Software (VMS) require annual license fees. 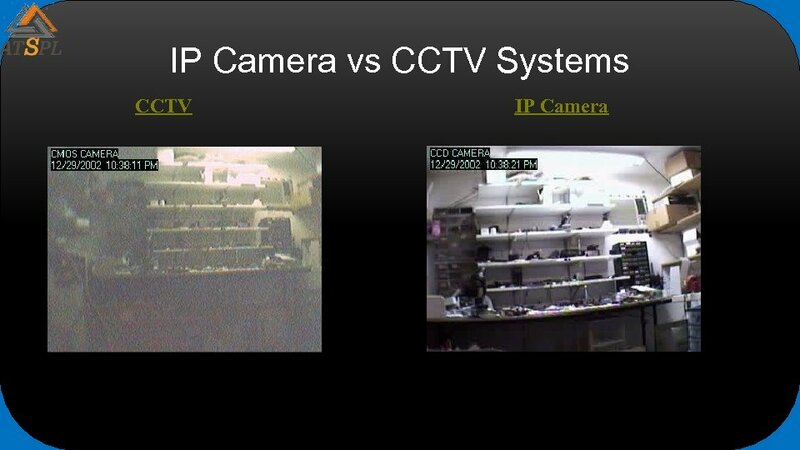 • IP NVRs can record up to 64 cameras (you can do more but it is not recommended) on a single machine. 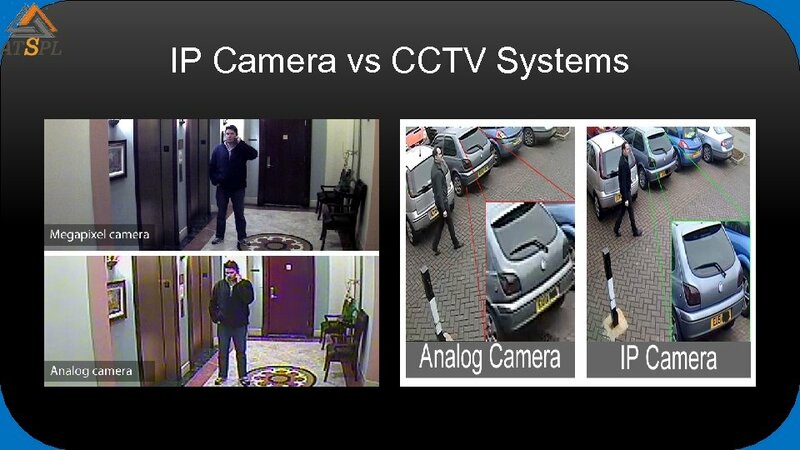 • IP Cameras are available up to 5 mp. 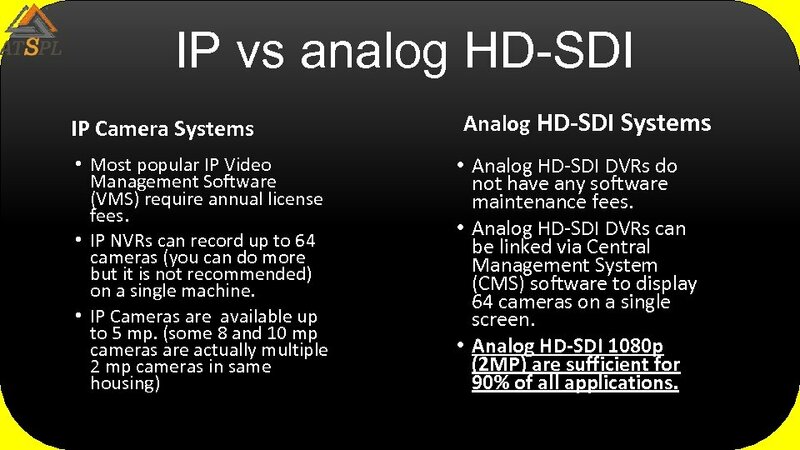 (some 8 and 10 mp cameras are actually multiple 2 mp cameras in same housing) Analog HD-SDI Systems • Analog HD-SDI DVRs do not have any software maintenance fees. 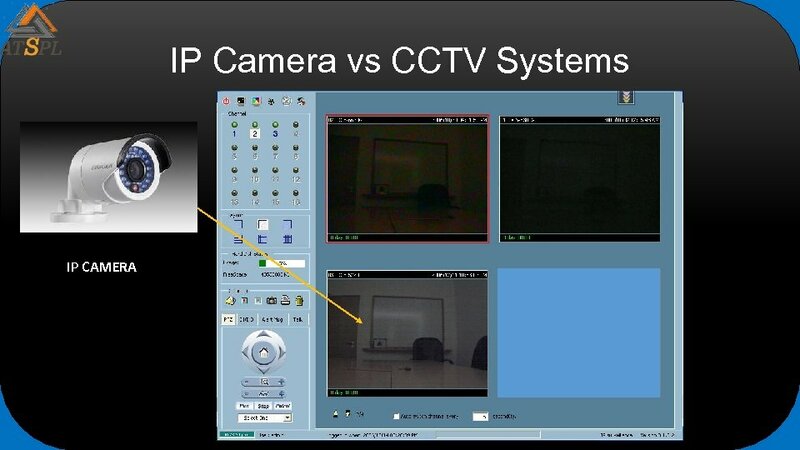 • Analog HD-SDI DVRs can be linked via Central Management System (CMS) software to display 64 cameras on a single screen. 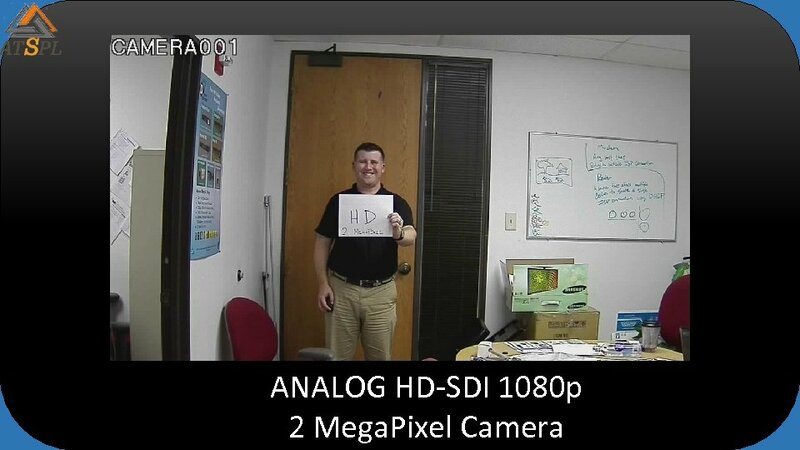 • Analog HD-SDI 1080 p (2 MP) are sufficient for 90% of all applications. 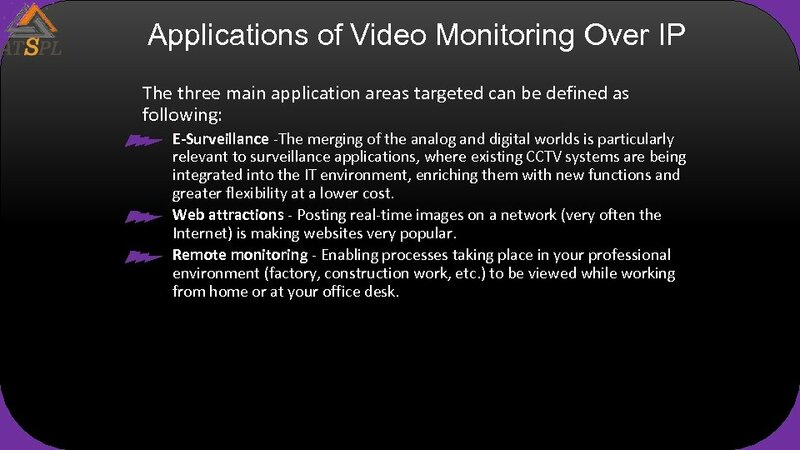 Applications of Video Monitoring Over IP The three main application areas targeted can be defined as following: E-Surveillance -The merging of the analog and digital worlds is particularly relevant to surveillance applications, where existing CCTV systems are being integrated into the IT environment, enriching them with new functions and greater flexibility at a lower cost. Web attractions - Posting real-time images on a network (very often the Internet) is making websites very popular. 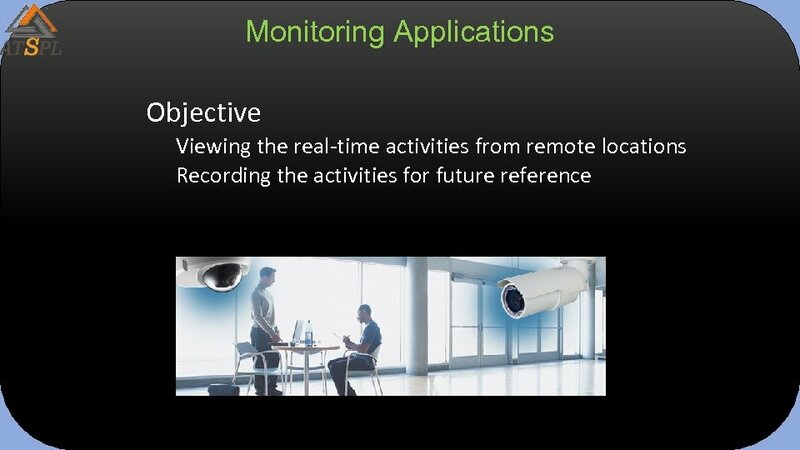 Remote monitoring - Enabling processes taking place in your professional environment (factory, construction work, etc. ) to be viewed while working from home or at your office desk. 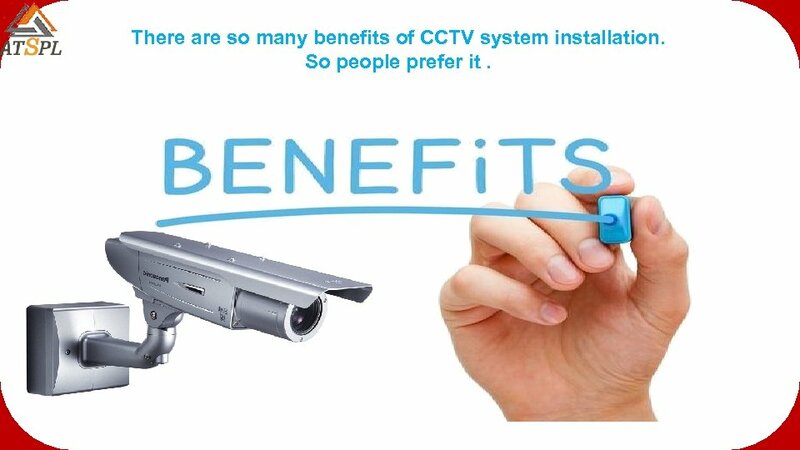 There are so many benefits of CCTV system installation. So people prefer it. 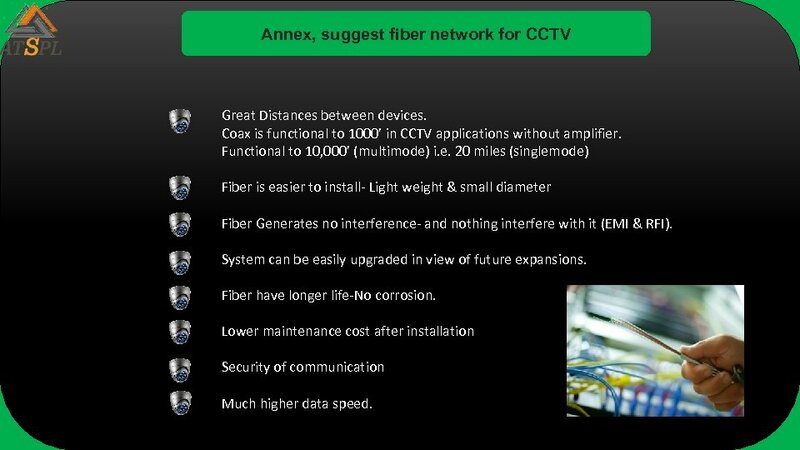 Annex, suggest fiber network for CCTV Great Distances between devices. 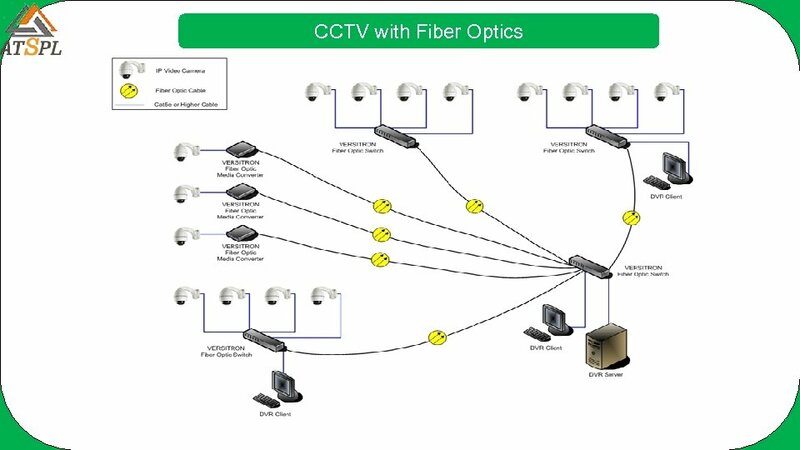 Coax is functional to 1000’ in CCTV applications without amplifier. Functional to 10, 000’ (multimode) i. e. 20 miles (singlemode) Fiber is easier to install- Light weight & small diameter Fiber Generates no interference- and nothing interfere with it (EMI & RFI). System can be easily upgraded in view of future expansions. Fiber have longer life-No corrosion. 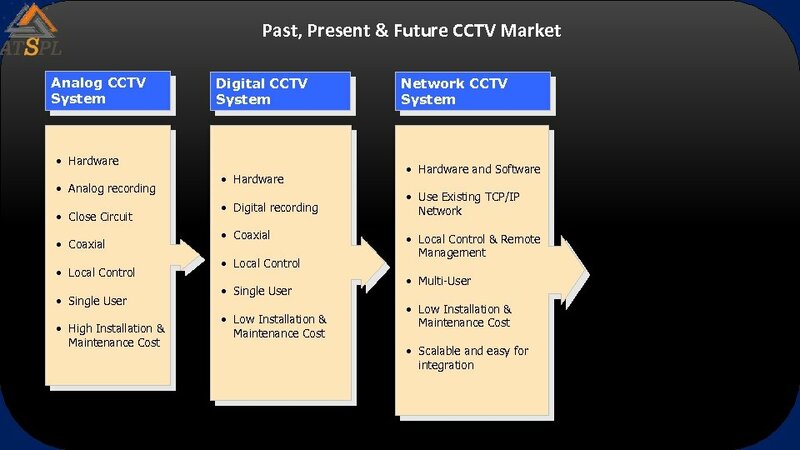 Lower maintenance cost after installation Security of communication Much higher data speed.